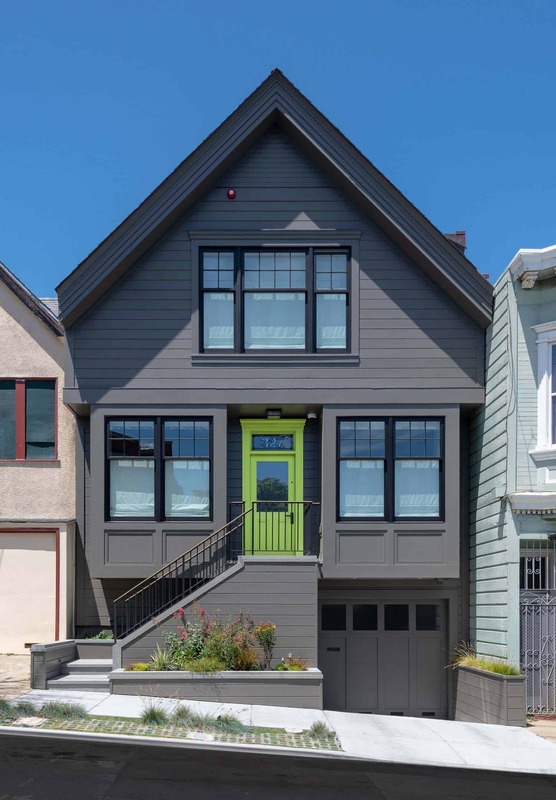 An Edwardian cottage built in 1910 was renovated by Gast Architects, located in Bernal Heights, a neighborhood in southeastern San Francisco, California. 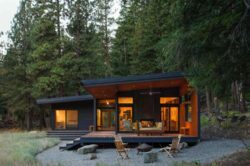 The original home offered just 1,335 square feet, now completely transformed into a warm and playful family refuge. A new layout offers 2,309 square feet, with two bedrooms along with an office/guest room and two-and-a-half bathrooms. 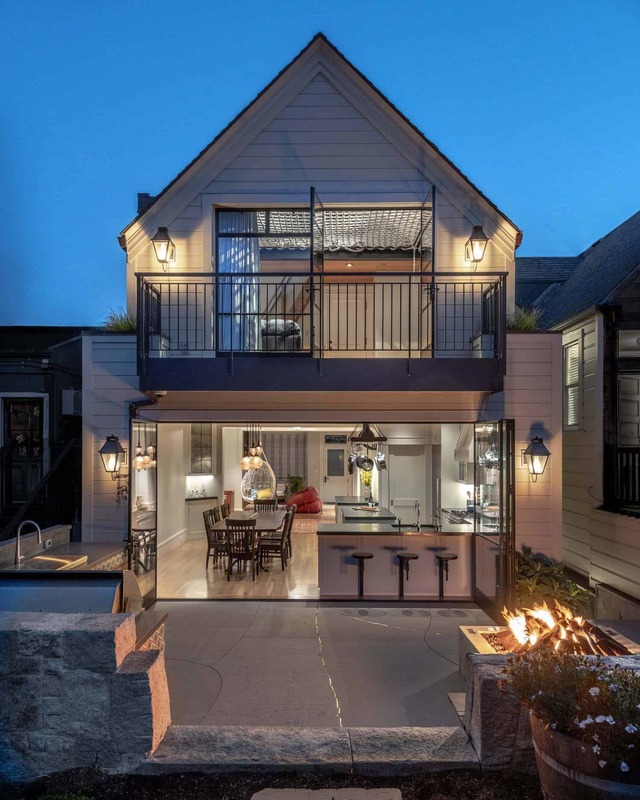 The main living floor features an open plan that flows out through the rear glass door system onto a patio with fire pit and outdoor kitchen. 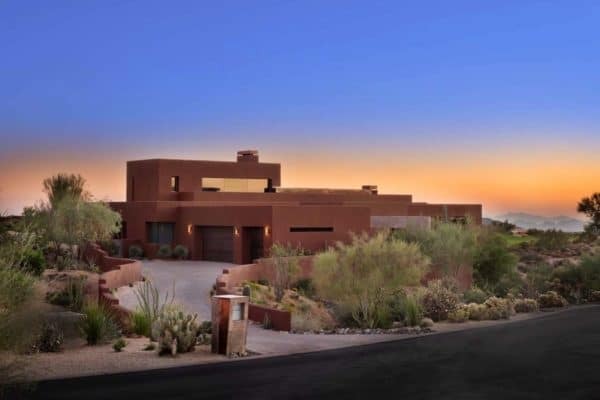 The upper floor houses a roof deck with spa that adjoins the hallway and master bathroom. 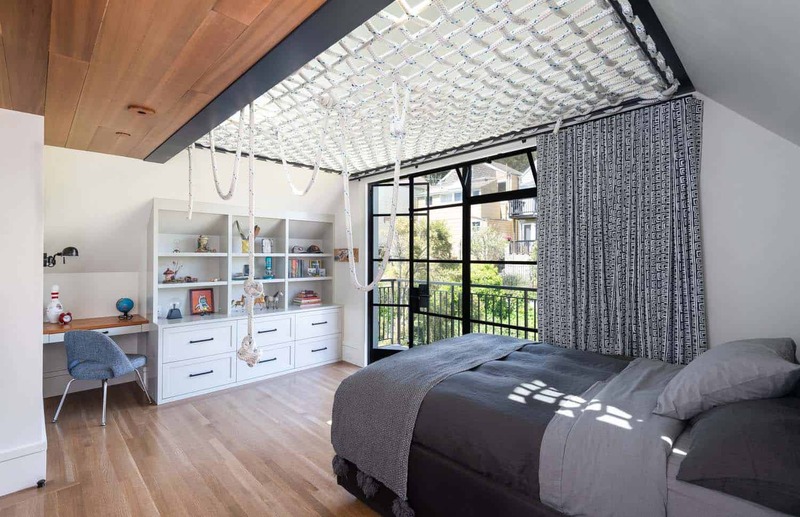 The child’s loft bedroom facing the backyard has a woven rope ceiling that can be walked upon. The complete renovation included updating of all building systems, seismic upgrading, and incorporation of sustainable features. Above: The primary exterior paint color is Benjamin Moore Deep Creek, 1477. The front door is Benjamin Moore Pear Green, 2028-40. 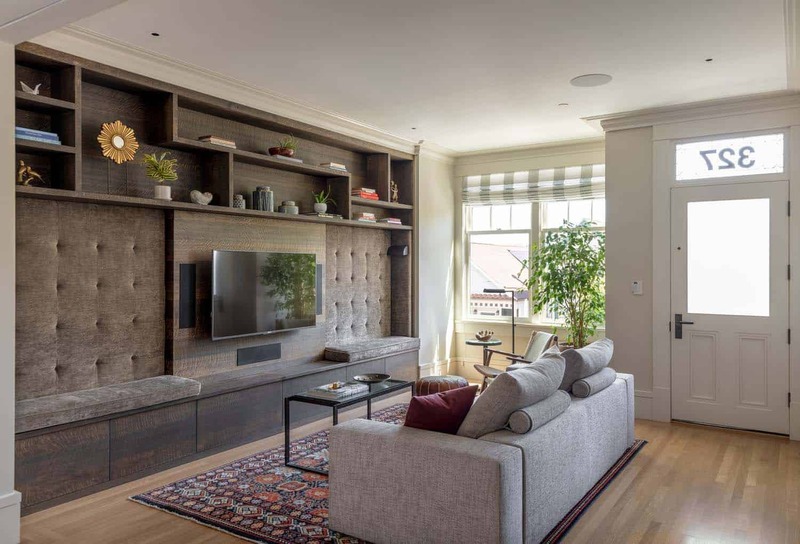 Above: The wood of this custom wall unit in the living room is a fumed oak. Since the living room is narrow, the built-in media wall was devised to help make the room feel more spacious. It also incorporates extra seating for an uncluttered yet playful look. There are drawers beneath the built-in bench seating for extra storage — they are touch-release. The flooring is a custom quarter-sawn oak. Above: Wall sconces above the cabinet in the foreground are Urban Electric-Metro. This cabinet serves as a bar, featuring a wine fridge and refrigerator drawers. The kitchen, dining, and pantry spaces together occupy a roughly 19 by 19 foot square. Dining table was custom made for the homeowner. The light fixture above the table features various antique fixtures with a custom canopy created for the suspension and wiring. 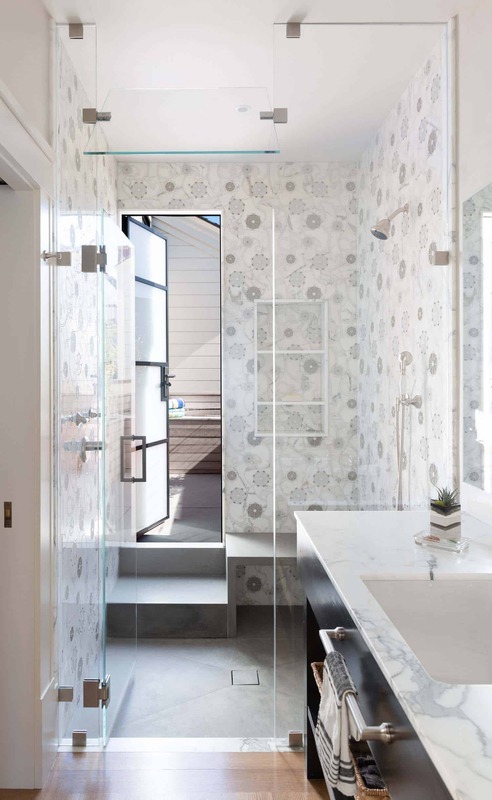 Above: The backsplash tile is from Ann Sacks – Nottingham, Honeycomb, Veil 4×4. The fridge is made by Miele – the spec is KF 1913 Vi. 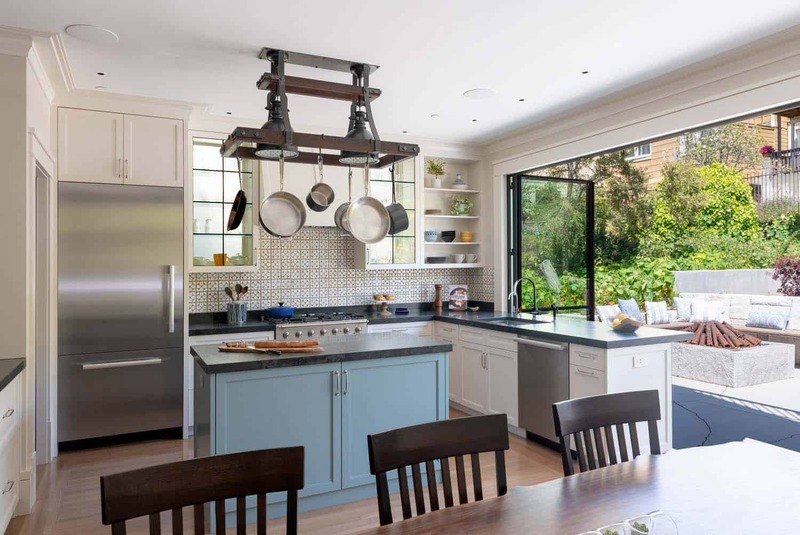 The pot rack was custom made for this project, it incorporates lighting from Circa Lighting. Above: The countertops of both the island and the surrounding cabinets are a natural slate. Kitchen faucets are Dornbracht brand from their Tara Classic line in polished chrome. 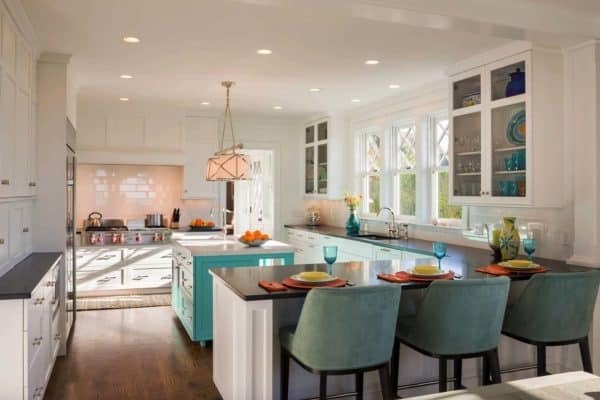 The paint color on the island is Benjamin Moore – HC-145 Van Courtland Blue. 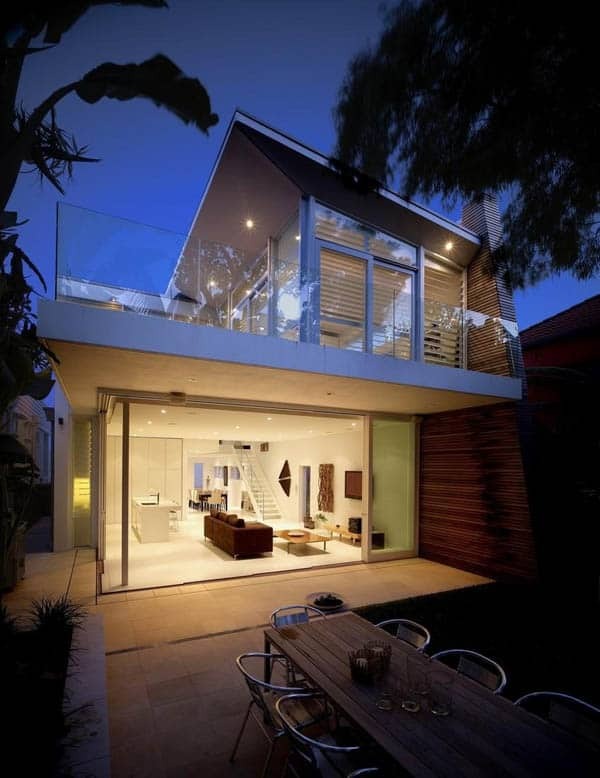 The sliding glass door system is from Riviera Bronze. That’s Interesting: To make an eat-in bar from the peninsula, the contractor had the bar stools custom made. When the doors are open, the stools can swing out and the seats fold down. The peninsula can then be used as an outdoor bar. What We Love: There are so many beautiful and thoughtful and creative elements in this transformed Edwardian cottage. The architects have shown the value of creativity to ensuring a functional fun and unique space. The renovation captures the original style and combines it with a modern, yet comfortable feel, creating an inviting family home. The stairs, and the original lighting in the stairwell are very practical and beautiful at the same time. 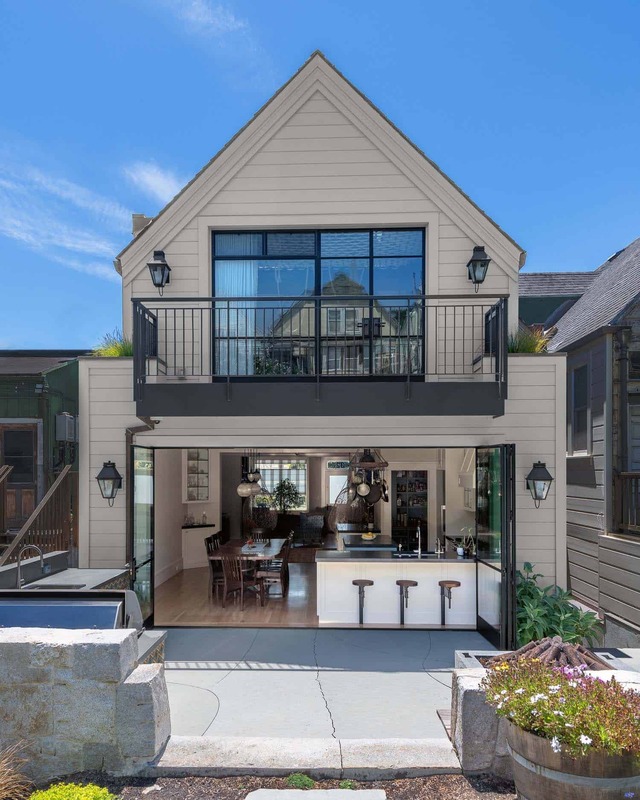 Last, but not least, we are loving how the roof deck is pocketed in, cozy and private… Readers, please tell us in the Comments what you think of this renovation project! 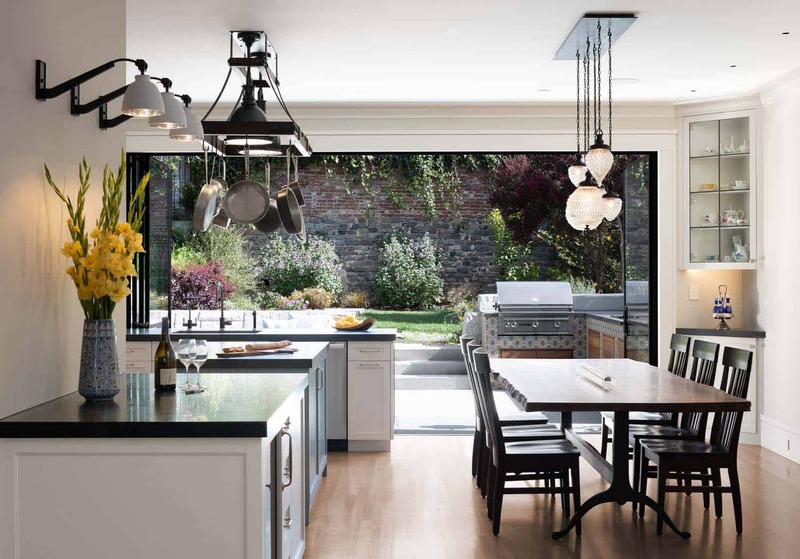 Note: Have a look at a couple of other home tours that we have featured here on One Kindesign from the portfolio of Gast Architects: A contemporary Edwardian residence in San Francisco gets transformed and Sustainably designed modern farmhouse near the California coast. Above: The pantry color is the same as what was used on the kitchen island cabinets: Benjamin Moore HC-145 Van Courtland Blue. The door in the corner is a broom closet. 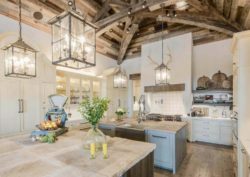 Counters are composed of vertical-grain Douglas fir framing pieces, reclaimed during construction. 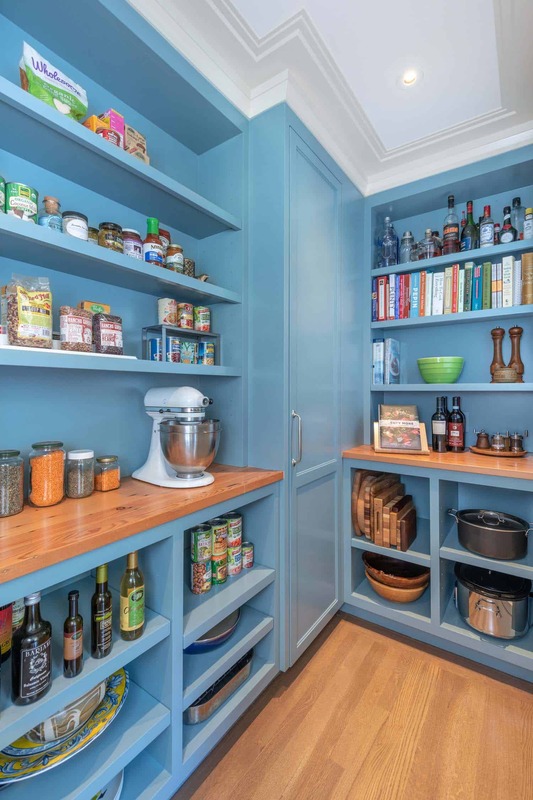 The overall dimensions of the interior of this pantry are roughly 5 feet by 7 1/2 feet. 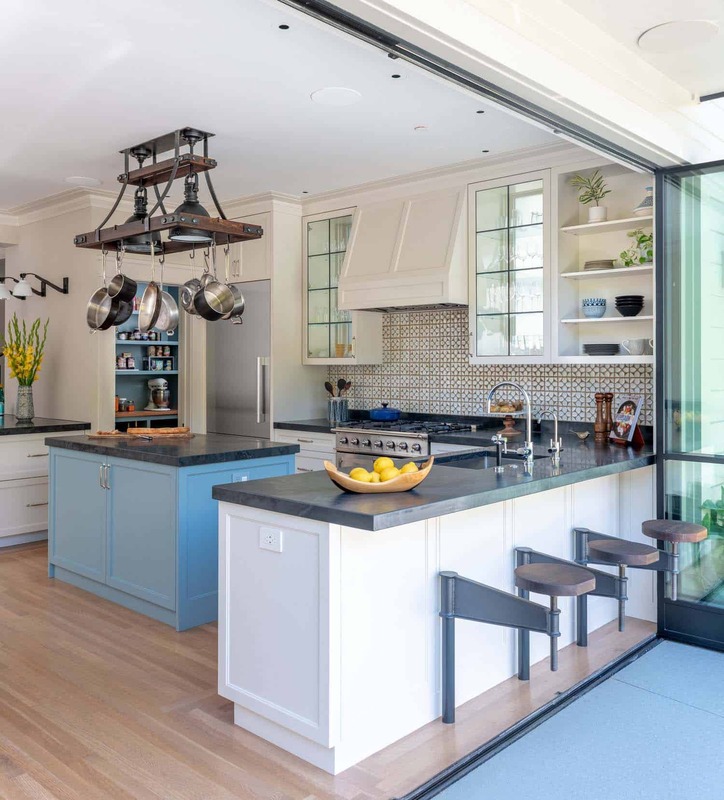 A pocket door closes this space off from the kitchen. Above: In the home office, the desktop material is Azurite from IRG. The pendant light is from Urban Electric and is called Dover Ball. Walls are painted in Benjamin Moore 1595 Rocky Coast (matte). From the doorway to the painting on the wall is 9 1/2 feet. The width, which includes the full size day bed is 11 1/2 feet. The doorway is 4 1/2 feet wide. Pocket doors allows privacy to this space when needed, which is located across from the living room. Above: The window treatment is a custom top-down bottom-up shade fabricated by The Roman Shade Company. The fabric was a custom selection from Romo Fabrics. The daybed features a queen-sized mattress to accommodate overnight guests. Built-ins underneath house linens. 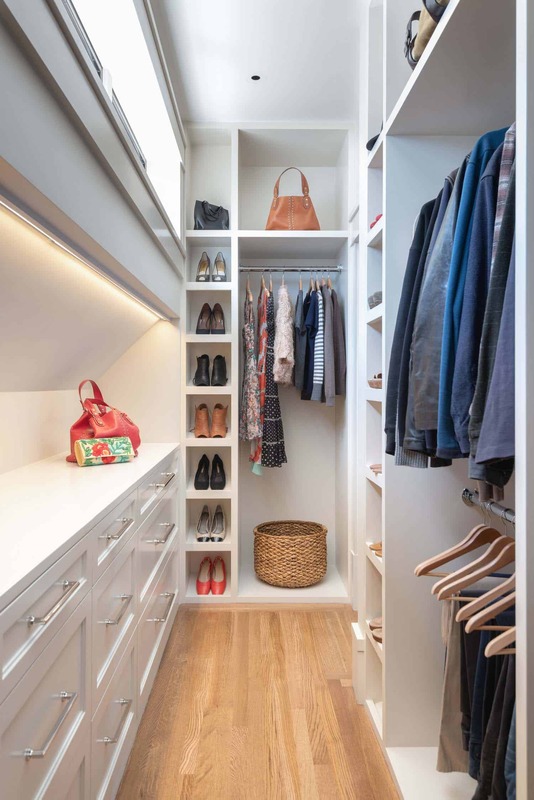 There is also a tall wardrobe closet next on the built-in wall to store guests clothing. 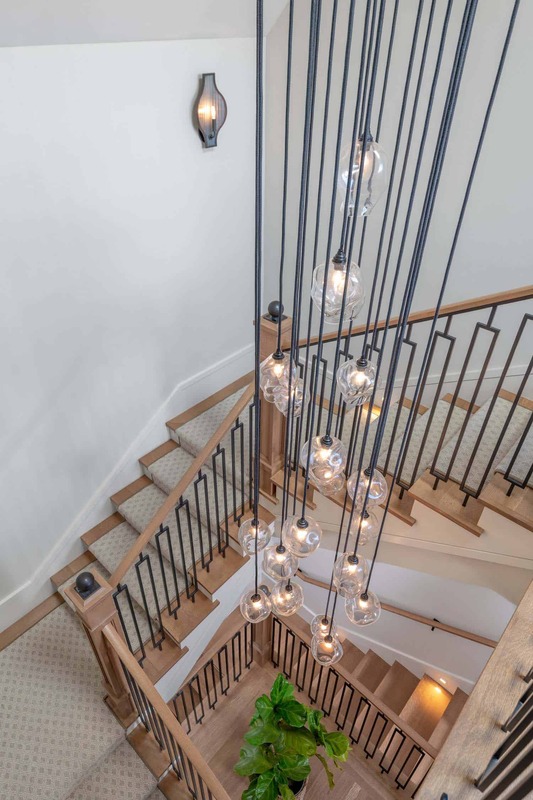 Above: The stunning cascading light fixture above the stairwell was custom fabricated by Mantra Art Glass. Above: There is a skylight above the light fixture, helping to illuminate this space with natural light during the day. 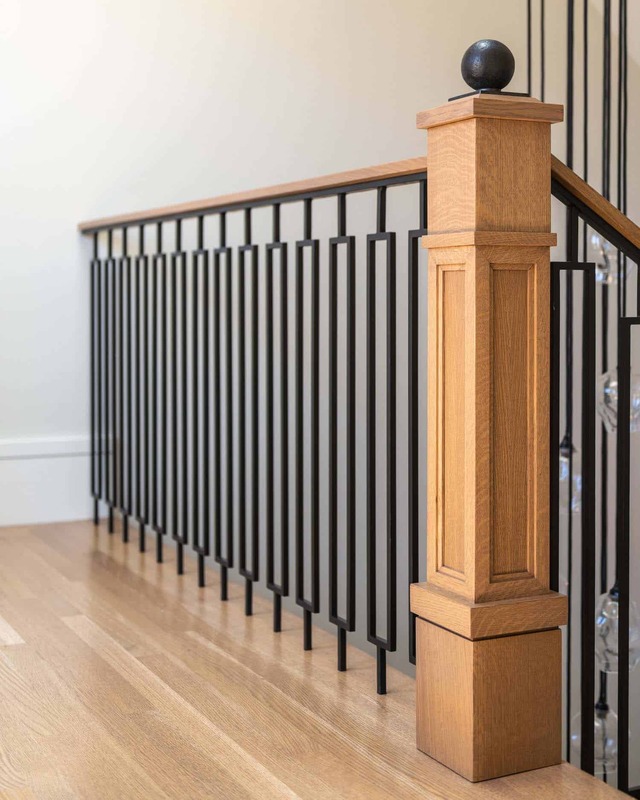 The posts, handrails and floors are European white oak. 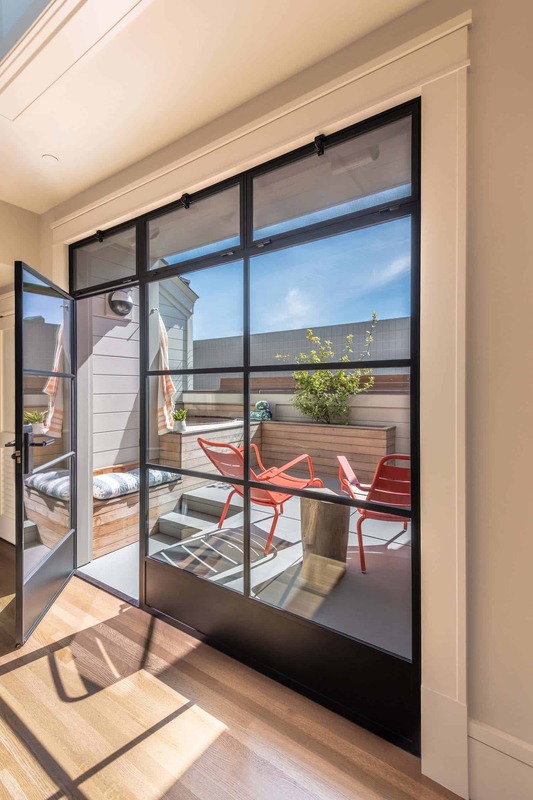 Above: At the top of the staircase landing, through a set of steel-framed windows, is a roof deck. 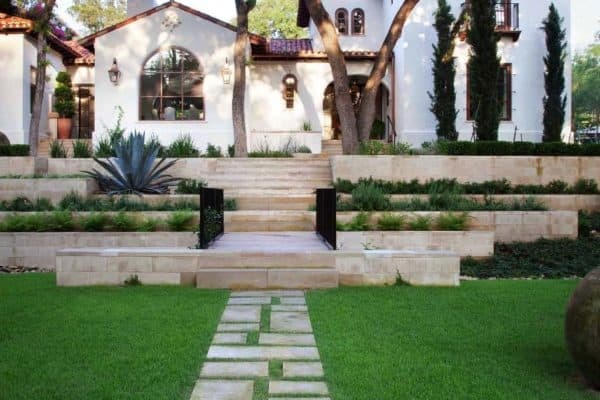 A spa is an added luxury to this outdoor space, wrapped with a wooden surround. Above: The pendant lights on either side of the bed are from Arteriors. The roman shade behind the drapes is a shear fabric from Pindler & Pindler. 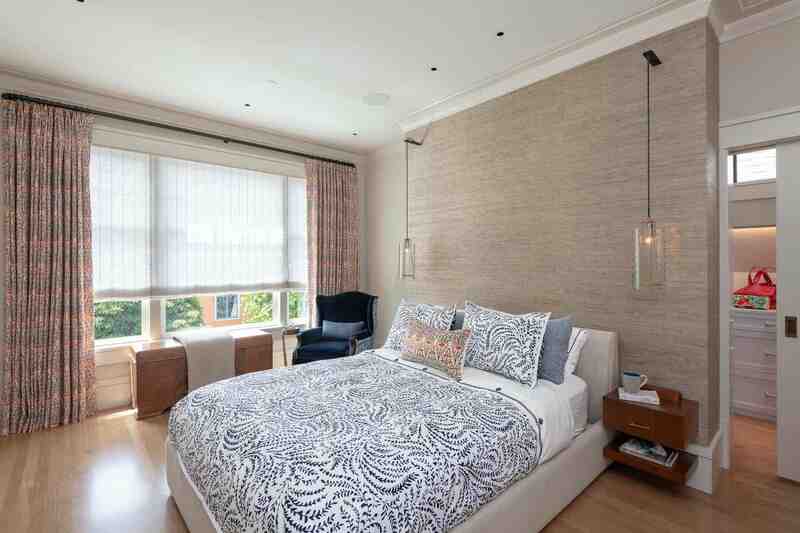 The accent wall behind the bed is grasscloth wallcovering. Built-in walnut nightstands helps to save space in this compact bedroom. USB charging stations are concealed behind the drawers within the nightstands. 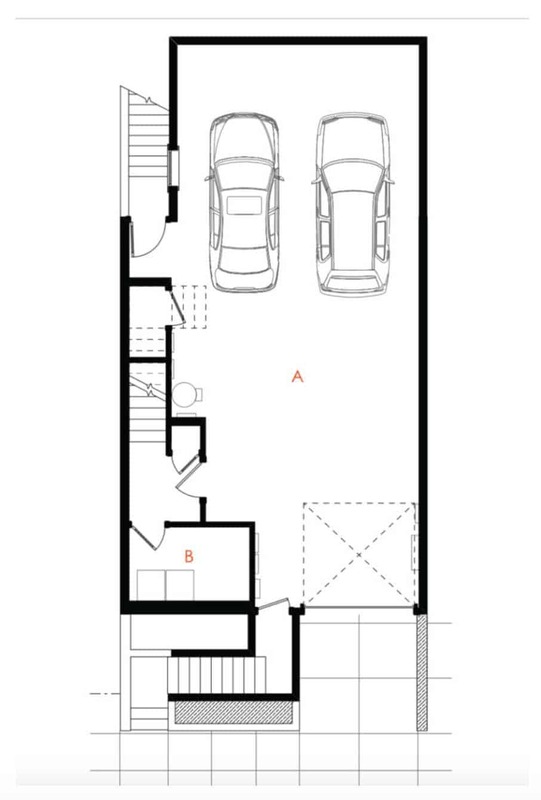 Above: This 6 by 13 foot closet runs along one side of the master suite under the sloping roof. The clear floor space between the dresser on the left (only 18″ deep) and the hanging clothes on the right is 3 feet. The closet can be closed off from the bedroom by pocketing doors. Above: The shower tiles are made by Artistic Tile – Fiori Calcatta Gold Water Jet Mosaic. The door leads out to a spa deck. Above: In the boys bedroom, the rope ceiling was the idea of the homeowner. 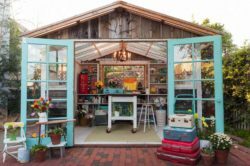 This space takes advantage of the roof’s gable, where a ship’s ladder leads up to the play loft. The rope ceiling is completely removable. Above: These stairs lead from the lower level garage and laundry room to the main floor. 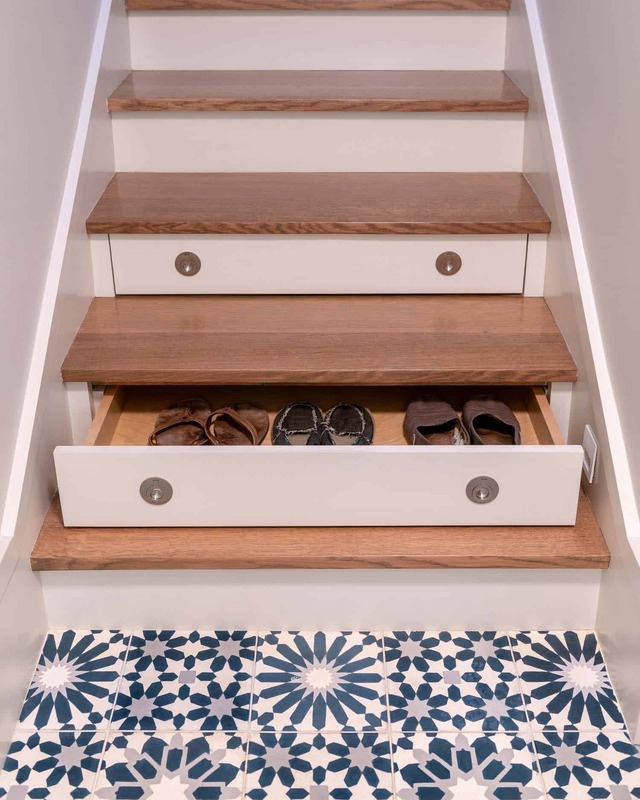 Hidden drawers in the staircase were designed so that the family could switch out their shoes for slippers before entering the main living spaces. The drawer pulls are the Omnia brand solid brass round drop ring pulls in Satin Nickel. The floor tile is Ann Sacks – MLB Mix Marrakesh, Fez, Tangler, 8×8. 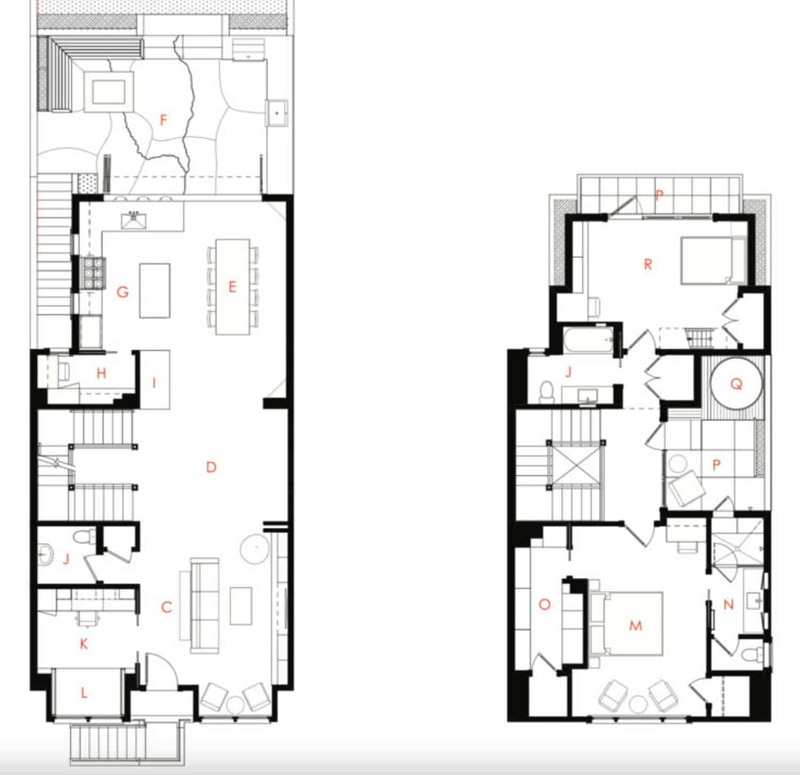 Above: The narrow lot is only 25-feet wide, which gave the project team only 23-feet in width to work with when laying out the footprint — living room, home office, kitchen, bedrooms and bathrooms, plus circulation. Above: A plan of the lower level shows an underground garage. “B” is where the laundry room is located. If needed, a third car can fit behind the two in the rendering. Nice home. Well put together. Thank you for the floor plan being included. Lets one see how the home flows. Thank you. John, so happy to hear you like this home! Yes, always great when there is a floor plan. We always try to get them whenever possible. So many architects do not like to share them.